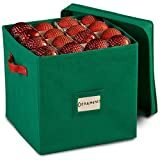 Ornament Safekeeping: Ornament box Store up to 64 ornaments with cardboard dividers that help keep decoration ornaments safe from scratches and shattering so they're always ready to show off for the Holiday season, Easter, Halloween, and other special occasions. 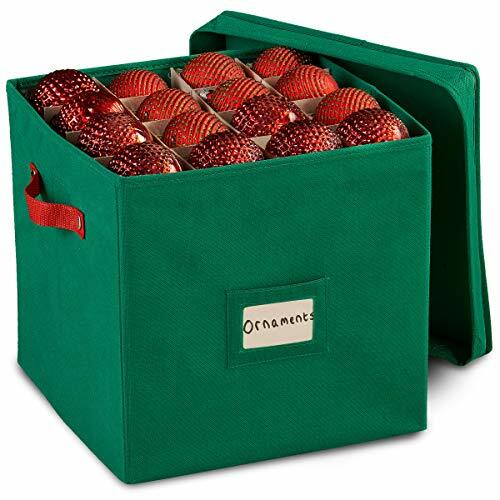 Durable Construction: Durable non-woven fabric and heavy duty cardboard ensures this ornament storage box Holiday will last many seasons to come unlike a holiday storage bag or bulkier, cheaper material holiday Holiday boxes, bins, and organizers. Simple Identification: Transparent card slot for easy labeling between all other Holiday storage . Lid protects ornaments and allows storage container to be stacked for space saving Holiday storage. Space Saving: xmas ornament storage containers holder's compact cube shape fits great in all storage areas; collapses flat for out of sight storage and unfolds open in a second.